An obligatory visit to the Taco House in Arnold’s Park, Iowa is a long-standing tradition to those who flock to the “Iowa Great Lakes” during the summer. One local said on Yelp, “Crowds, mess, long lines and sometimes indifferent food served up by surly local teenagers in the middle of Northwest Iowa doesn’t necessarily give one hope of a culinary high adventure!” That is unless you are getting their Pueblan Style Shredded Chicken, Tinga de Pollo. Pueblan Style Shredded Chicken, Tinga de Pollo is one dish the Taco House (and other Mexican places just like it, sprinkled across the States) so often do right. It’s a dish with deep roots in the street food of the Mexican state of Puebla. What we in the States commonly call Mexican Shredded Chicken (Pollo Deshrabo) and sometimes Pueblan Chicken, is becoming more commonly known by the name Tinga de Pollo – or Chicken Tinga. In spite of the identity crisis, everyone will recognize what I’m talking about: an earthy, slightly smoky mound of shredded chicken spiked with a touch of vinegar and a few inexplicable flavors. The smokiness of the Chipotle melds throughout the dish, accented by mellow onion and garlic and the faintest hint of tomato. Marjoram, an herb so often ignored, brings in just an elusive taste and scent. The teensiest, tiniest pinch of clove chimes in with a back note of warmth. 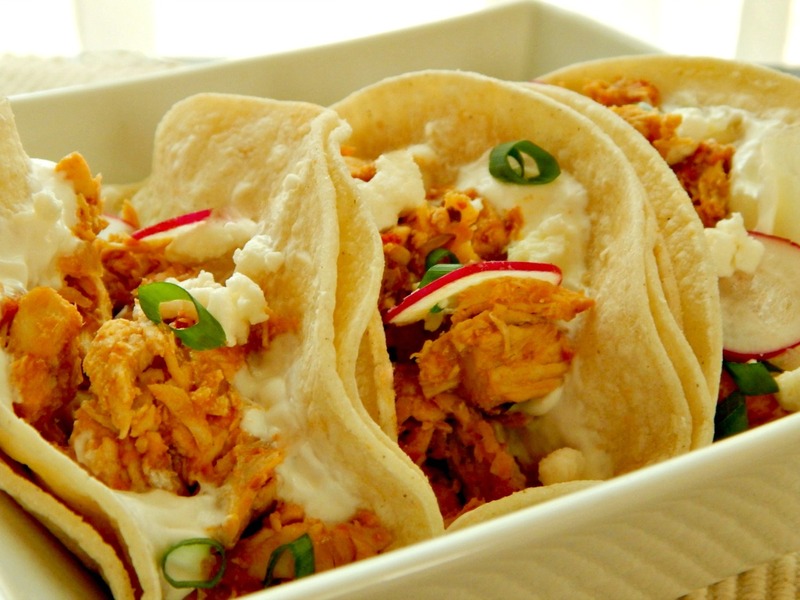 Chicken Tinga is not normally “hot” but oozes with flavor. And ooze it does. After a bite or two there may be juices running down your hands and you’ll find yourself hunched over the paper wrapper. You can’t stop or you’ll risk disaster – as if you’d even be able to stop. Addictive. And now you have the secrets right here, to be made at home anytime you’d like. Dangerous. And best of all, you can make it as mild or as hot as you’d like. Perfect. Serve your Pueblan Style Shredded Chicken, Tinga de Pollo like they do in Cali on a crisp tostada slathered first with Crema, then with the luscious Tinga de Pollo, sprinkled with a few wafer thin onions strewn over top. Or make it a soft taco and heap with your favorite condiments and toppings. You just can’t go wrong! And do pass your favorite hot sauce or salsa! Crisp corn tortillas or two softened corn tortillas to use as a soft shell taco. Flour generally won’t hold up well to this oozy chicken. Very thinly sliced onion, soaked in water for about 15 minutes. Very thinly sliced red or green cabbage or chopped or shredded lettuce. Standard “orange” cheese or even better, Queso Fresco for a bit more punch. Radishes for crunch; an often overlooked ingredient in Mexican foods. And of course, an array of your favorite salsas or hot sauces, crema or sour cream. And of course, with all this gorgeous chicken, you can make any of your Mexican standards. Tostadas, tacos, burritos, flautas, even stuffed potatoes or sweet potatoes. or a fave at our house, chimichangas. I am totally in love with my Chipotle Stuffed Poblano Peppers with Rajas Sauce. Since this makes a good sized amount of chicken, maybe freeze some; it’s like an asset in your freezer for days you need to toss together something fast. Pueblan Style Shredded Chicken, Tinga de Pollo is a real deal, slowly braised Mexican Shredded Chicken, and it doesn’t take a long time to make but has a few steps and making a larger batch is a great way to maximize your time and effort. As I developed this recipe, I knew I wanted a bigger batch just so I could divide and freeze some as a kind of meal prep proposition, especially since this freezes so well. . I really had Pueblan Style Shredded Chicken, Tinga de Pollo in mind to use one of those standard 3 1/2 bags of frozen chicken. Just thaw (in something, those bags ALWAYS leak) overnight, drain off any liquid and proceed. That’s going to give you about 9 cups and you can count on about 3/4 cup per person for a meal, so divvied up, it’s 3 meals for a family of four. This recipe yields about 9 cups of shredded chicken and a quart and a half of amazing broth. In addition to all that shredded chicken, you’re going to end up with around a quart and a half (six cups) of marvelous leftover, beautifully flavored broth that can be put to good use elsewhere – it’s just right for Tortilla Soup so save a bit of the chicken back just for that. Or check out my main soup menu, Soups, Chowders & Chilis, where I have a few other outstanding Mexican inspired soups. Feel free to cut the recipe back if you’d like, but trust me, a bit of this in the freezer is an asset, to be sure! Total cost for the chicken runs about $8.10, for a meal, the chicken portion is about $2.70. Do buy that frozen chicken on deep sale and always be prepared to compare the oddly portioned (3 1/2 pounds) package to the price of fresh chicken priced by the pound. Take the cost of the package, divide by the number of ounces (54 ounces) then multiply the price per ounce by 16 (since there are 16 ounces in a pound) to get the per pound price. I generally place the remaining peppers and adobo sauce in a Ziploc bag, label, and freeze. They thaw quickly on the counter or can be placed in the microwave for a few seconds when you’re ready to make another dish. Place chicken, onion, and garlic in a Dutch oven or large pan, add enough water to cover by an inch. Bring to a boil, then reduce to a simmer. Skim off any foam that comes to the surface. Add marjoram, salt & peppercorns after skimming. Simmer for about 20 minutes until chicken is just done all the way through. Turn off heat and allow the chicken to cool in the broth for 45 minutes (if time allows, for the moistest chicken) or remove and cool (for quicker chicken.) Strain and reserve broth, onion and chicken separately. See note. Cut chicken into several smaller pieces and shred with two forks, clean hands or remove to the bowl of a mixer with paddle attachment and shred it. Make sure to use a guard if you have one, and a make piece strip of foil will work, too. In a blender add the reserved onion, chipotle peppers, salt and a cup of chicken broth. Puree. Add drained tomatoes and pulse several times. Heat the oil in a large skillet (or deep pan like a Dutch oven) over medium heat. Add in thinly sliced onion and cook until slightly browned on the edges, stirring often. Add minced garlic and cook another minute. Pour the sauce into the skillet, being careful of any spatters. Cook several minutes, then add shredded chicken, marjoram, vinegar and a very small pinch of cloves. Careful; clove can be strong and easily overpower this dish. you can always add more. Taste for seasoning and add more of the Chipotle, vinegar, salt, and/or herbs as desired. Simmer gently 15 to 20 minutes, adding some of the juice from the tomatoes if it appears to be too dry. The final dish should be moist, but not too saucy. If it’s too wet, add your chicken to a strainer. Pueblan Style Shredded Chicken, Tinga de Pollo stores well in the fridge and tastes even better the next day. Freeze for two to three months. To freeze, place plastic wrap directly on top of the chicken mixture before lidding or freeze in a heavy Ziploc bag. This dish is normally not “hot” but heat level is easily varied by the amount of chipotle pepper added. Two give hardly any heat for this amount of chicken but still add flavor, four is a bit more noticeable, but not “hot.” Some use a whole can. Know your audience and their tolerance levels. The rest of the flavorful chicken broth can be used in a soup; see body of text in the post. For crisp tostadas, heat a quarter inch of oil in a small heavy skillet until about 350 degrees F., or until, when the edge of a tortilla bubbles when placed in the oil. Carefully place a tortilla in the oil and fry until crisp and golden on one side. Turn and do the same. Drain on paper towels or on a rack, if you have one, for the crispiest tortillas. Repeat with the rest, replenishing the oil as needed. If you’d like soft tacos, place in oil, turn over and then very carefully cook until just a few bubbles appear and the color slightly changes then turn again, just as you would prepare conditioned tortillas for enchiladas. This entry was posted in Click here for Bargain Meals, Click here for Fabulous Food Posts and tagged Bargain Meal of the Week, Chicken, chicken tinga, Chipotle, Freezes Well, Mexican or Southwestern, Vinegar. Bookmark the permalink. I first had this chicken in the cafeteria in the hospital where I work, Hennepin County Medical Center in Minneapolis. It was one of the choices for “burrito bowl” day, along with beef, pork and beans, served w/rice and other accompaniments. I had it with black beans, a little cheese and sour cream. I thought it was amazing and was wondering how I could make it home. Thanks for sharing this recipe — I can’t wait to try it!